NOW ON YOUR OWN MOBILE DEVICE!!! 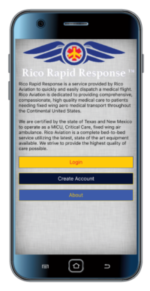 Download the Rico Rapid ResponseTM app today to help ensure the safety of you and your loved ones. The touch of a button sends us your location and connects you directly to a Rico team member allowing us to quickly dispatch a flight to your location. Our app even has a unique flight tracking option. This means that you can see exactly where we are so you don’t have to sit and wonder when your flight will arrive. We have designed our app specifically for use by medical professionals and caregivers in order to foster smooth and timely patient transfer. The most common cause for use of fixed wing air ambulance is when a patient is presented to an ER with injuries beyond the capability of that facility. Serious injury, escalating illness, and specialized operations are all instances that could necessitate long-distance air ambulance transport. Once a medical team has made the decision to transfer a patient in order to access more specialized treatment, Rico Rapid Response comes into play. Upon activating the one-touch dispatch application, the transferring Nurse, Doctor, or Paramedic is put in contact with a Rico team member. From the app, The flight crew’s progress can be tracked and pictures of the responding crew are shown to help with recognition upon pick-up. After preparing the airplane and contacting the transferring facility to receive a patient report, the Rico team is dispatched to the patient’s location to facilitate patient care and accompany the patient to the airport. This is where our Rico continued care philosophy takes hold. When we are trusted with a patient, we understand the importance of the task at hand. Our goal on every flight is for the patient to arrive at the receiving facility in better condition than when we received them. Our Air Ambulances are equipped with the latest life support and medical equipment and our flight nurses and paramedics have the highest level of certification available for their fields. Our aircraft also have room for a family member to accompany the patient to help ensure emotional comfort as well as physical comfort. Upon landing, our team accompanies the patient to the receiving facility and provides a full report to the receiving team before gathering equipment and preparing to head home. Finally, our flight crew contacts the transferring facility to give a follow-up on the patient’s response to treatment and current status. In sharing our process, we hope to have provided some context to the service we offer and that you know more now than you did before you began. The medical transport business is a vital step in ensuring care in any situation and we’re thankful every day to be able to offer that service.